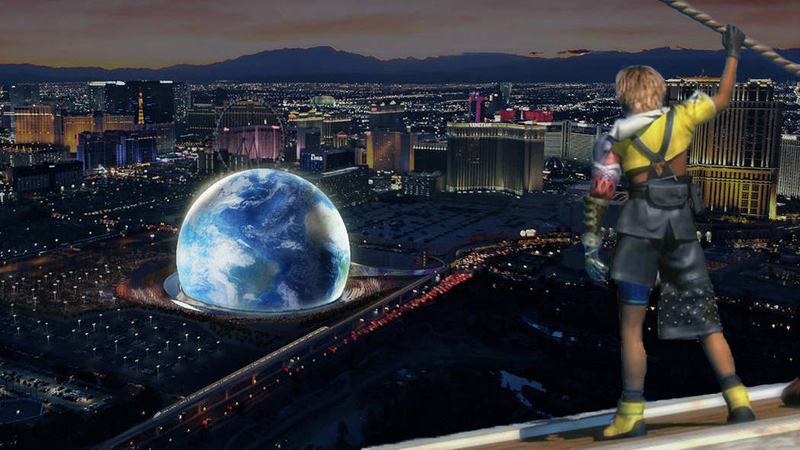 The Madison Square Garden Company will break ground this summer in Las Vegas, according to officials (via AP), to build a massive sphere with projection and lights that sure does look like a damn blitzball arena from Final Fantasy X. The 170,000-square-foot LED screen that wraps around the interior bowl of the sphere can project images to make the sphere look like a globe, tennis ball, or even reflect the event happening inside. It’s expected to open on New Year’s Eve in 2020. I posit that by that time, we can invent a way for humans to breathe underwater with full range of motion and then we can get this sphere’s true purpose underway: playing Spira’s greatest sport. Blitzball is the watersport played by many of the characters in the groundbreaking PlayStation 2 role-playing game Final Fantasy X. Competitors swim around in a massive sphere filled with water, attempting to throw a ball into the enemy goal. It’s like soccer or hockey, except it defies all laws of physics and is totally rad. I respect the cool things this sphere can already (theoretically will) do. But come on. Live a little, MSG. Fill that bad boy up with water and let’s play some damn blitzball.